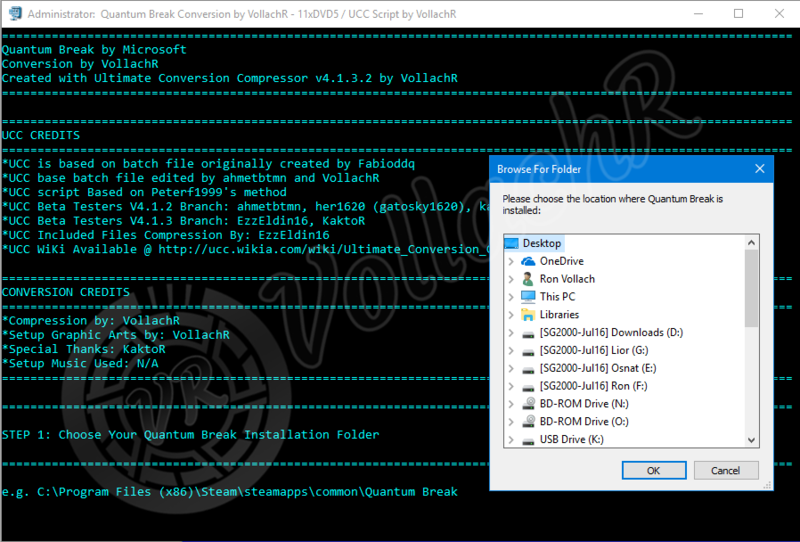 Ultimate Conversion Compressor (UCC) - V4.1.3.2 Update 3.0 Out Now!!! January 19th 2018: UCC is 2 years old, Happy Anniversary!!! March 6th 2018: Uploaded new version of the CIUv205g UCC Addon (CIUv205gUCCAddonV2.rar) with support for UCC4132U2 new compressors. March 8th 2018: UCC v4.1.3.2 Update 2.0 LOLZ Fix (UCC4132U2LolzFix.rar) Released!!! March 26th 2018: UCC v4.1.3.2 Update 2.0 Hotfix 1 (UCC4132U2Hotfix1.rar) Released!!! March 27th 2018: UCC v4.1.3.2 Update 2.0 Hotfix 1a (UCC4132U2Hotfix1a.rar) Released!!! May 4th 2018: UCC V4.1.4 Enters Beta Testing stage, PM me to apply for Beta Tester, Thank you. May 24th 2018: UCC v4.1.3.2 Update 3.0 Hotfix 1 (UCC4132U3Hotfix1.rar) Released!!! From what I could see only versions 2.0.4 by BAMSe and 2.0.5G series have precomp support. I don't know about v2.0.3.9, couldn't see any precomp files in it. So, if anyone can test and confirm if the supported versions of precomp in these CIUv2 versions extract correctly when packed by UCC it would be great. Also, please note I've never used anything other than CIUv2, so I can't say which other scripts will work with which compressor and version, please, if you try to use something other than CIUv2 with files created by UCC, post your results in this thread, good or bad, so we could start compile a list of what work and what not and perhaps do something about it. That said, as of February 1st 2018 you can now download a rar archive containing most/maybe all files needed to make CIUv2.0.5g series compatible with Ultimate Conversion Compressor. All you need to do is extract it into the folder containing your CIUv2.0.5g files and replace existing files if asked, that's it. CIUv2.0.5 UCC Addon attachment updated to support changes in UCC v4.1.3.2 Update 2.0. Please Note: CIUv2.0.5g, while technically now support all available compressors in UCC with the updated addon attachment WILL NOT work with uelr (unreal engine lzo recompressor) & bpk (binkpack), no matter what it keeps giving out errors, even though the archives are fine, use CIUv2.0.3.9 U10 and Records.ini files for these. A long time ago (In a Galaxy Far, Far Away ), Back in November 2014 I started out doing my own conversions with a simple batch script based on Fabioddq's original script. Over time I improved it and added some functions, in 2015 that script became something more, a full blown tool for conversion compression, it was originally released on another (no longer active) website I was a member of on January 19th 2016. Back in July of 2016 I stopped working on the tool as it was pretty stable and I had other (personal) things to deal with, About 3 years since the beginning and almost 1.5 years after I took that break, I finally started working on the script which was now known as Ultimate Conversion Compressor (UCC). The first version of UCC released here on FileForums was v4.1.2.1 which wasn't a big updated but enough for me to put it out there. Since then, UCC have seen quite a few updates, big and small and I have no intention of abandoning it in the foreseeable future. That said, the current version as for the time of these lines (v4.1.3.2) is planned to be the last big updated until I can convert the script to a much better, more versatile, more secure scripting language, UCC will still get bug fixes when needed, possibly even compressor updates (to keep it relevant) but not much more. Ultimate Conversion Compressor V4.1.3.2 Update 3.0 - Out Now!!! I hope you find this compression script/tool useful, I know I don't use anything else. The download link at the end of this post is a RAR 5 archive, so you'll need WinRar 5 or above to extract it, it includes all you need for the script to work, as well as a PDF format tutorial to learn how to use the script (it's not hard at all). This script is by far the most extensive & ambitious script/project I've ever done, the scope of the code is far beyond anything I've done before, that's why I didn't release it without beta testing it as thoroughly as possible. You can also find a few screenshots at the bottom of this post, please be advised, final release may vary a little from the screenshots a little. Note: These fixes were initially planned for 4.1.4/4.2 but due to the last bug in the list are being released as an hotfix. Bug Fix: Fixed bug with Records.ini creation where the last record type was missing the archiver name (e.g FreeArc,Winrar,7-Zip) before the underscore (e.g. _Split instead of FreeArc_Split) if Data2.ini and higher were present and OneDataOnly was Enabled. Bug Fix: Accidentally included wrong 7z.dll file in [Common\Include\Compressors] folder, file replaced. Bug Fix: Fixed bug which caused premature end of script when UCC perform game folder size check. Bug Fix: Fixed Rar & 7zip error handling and temp files deleting problem due to incorrect location of errorlevel check in script. Bug Fix: Fixed Rar Archiver Error message, there was an error in the script that caused both answers for retrying after an error to just re-load the error message. New Feature: CIU2.0.3.9 Records.ini - New option in Settings.ini called DataRecords tells UCC to create a records.ini file for the created data file even if File Splitter isn't being used, this is required for CIUv2.0.3.9 setups. Bug Fix: Fixed CLS-Diskspan bug introduced in UCC v4.1.3.2 Update 2.0 - Hotfix 1 that caused compression to not work correctly when not using language specific Include/Exclude options. Arc.ini Changes: Srep/Srep64 Entries no longer include the -m3f switch so you can decide on -m3f/-m5f/etc by yourself, just type srep:m3f in method to use -m3f switch. Script Improvement: Improved tempfiles folder deletion script, should only be deleted now when script ends normaly or with scripted error message. Bug Fix: When using CLS-Diskspan, compression would occur even if files already exist due to missing check, this is now fixed. Bug Fix: Extra, un-needed conversion header shown during diskspan file distribution due to extra call in script, fixed now. Bug Fix: When using CLS-Diskspan, autorun creation for discs 2 and above failed to create the OPEN=0 line, this is fixed now. Bug Fix/Script Improvement: Fixed diskspan script, it now handles file exclusions normally without the need for previously implemented workaround. INI Changes: Moved CLSDiskspan option from Data#.ini files to Settings.ini since using diskspan forces only single data (multi) archive creation, it make more sense to have it centralized as a single master switch in the Settings.ini file. Bug Fix: Fixed a bug that caused CLSDiskspan to always show the FreeArc encountered an error message at end of compression, even though there was no error in compression. Bug Fix: When using CLS-Diskspan with DVD5 size parts the first disk didn't always have enough space for the Setup.exe file, this is now fixed. Script Optimization: Some minor script optimizations like removal of unused lines. Bug Fix: Splitter sometimes produced an error when the data archive is very large because it didn't have enough time to be written to folder completely when the splitter operation started. Bug Fix: Fixed bug that effected folder names and autorun.inf labels when LabelSuffix wasn't set in Settings.ini. Bug Fix: Fixed bug that caused UCC to ask for ISO location selection even though the user selected to use the default location for ISO files. Bug Fix/Compressor Changes: Removed FAZIP.exe from UCC since it had some sort of clash with the arc.exe and caused the default freearc methods (m2, m3, etc.) not to work, it is also not needed as FreeArc can handle all methods used by FAZIP by itself. Script Improvement: UCC will now search for known illegal file/folder name characters (? )(*) in the Discs# variable and replace them with the HASHTAG (#) sign to prevent errors. Script Improvement: UCC will now check if the option Discs# in Settings.ini is left blank and if so will set it to use the HASHTAG sign (#) as placeholder to prevent errors. Bug Fix: Fixed bug with ISO creation That prevented ISO files from being created correctly (Files wasn't in ISO root). Bug Fix: Fixed bug where wrong text whas shown in the folder selection dialog box for ISO location. Script Improvement: Improved script handling of conversion output folder selection to make it more simple to understand. Feature Improvement: Changed the way Redist distribution works, will no longer be stored with the Setup.exe & Setup.ico until distributed. Feature Improvement: UCC Can now use external lists files in combination with regular Data#.ini file listings (e.g: Data1.ini can use a list file while Data2.ini list files directly). Folder Changes: Added Separate (OPTIONAL) folder for additional files (e.g. Extras), now UCC will copy any files in the [Common\Files\Misc] sub-folder to last Disc of Conversion. Folder Changes: Added New (OPTIONAL) Sub-Folder: [Common\Files\Redist] to be used for Redist Distribution. Folder Changes: Changed default folder for ISO files creation, ISO will now be created in [ISO] sub-folder inside the conversion output folder. Splitter Bug Fix: Splitter can now recognized if a file is already split when splitting game files and not only when splitting the archived file. Settings.ini Changes: Removed "UseListFiles" option (Moved to individual Data#.ini files). Data#.ini Changes: Added variable "UseListFile" (Replaces "UseListFiles in Settings.ini). Behavior Change: Retrying after compression error no longer ask you to restart from game folder selection, it will now just go back to beginning of compression and try again. Behavior Change: UCC now creates a Disc folder inside the conversion folder for single disc conversions again to prevent ISO creation problems (e.g: Conversion_Output\Game_3xDVD5\Game_DVD) - See 2nd Bug Fix. Bug Fix: Fixed bug that caused compression to return an error when user selected a custom output folder. StartUp Changes: Added a warrning message after the UCC "Splash" ended to warn against antivirus interference with compression process. New Function: UCC Will now automatically generate the Records.ini file when needed. Function Improvement: UCC will now copy additional files located in Common\Setup folder that are not REDIST or Setup.exe/Setup.ico to last disc of the conversion instead of the first. Splitter Improvement: You can now input any of the presets available in the size selection menu into the SplitSize varialbe in Settings.ini (1GB, 2GB, 3GB, 4GB, DVD5, DVD9, BD25) or as usual type the size in MB. Visual Changes: Improved Starting & Ending "Splash" screen. Visual Behavior: AIO conversions: More customization, can now optionally display the list of games included in the conversion and the expected folder name for each game. Settings.ini Changes: Added one additional executable check option, now you can perform check for up to 10 EXE files instead of 9. Settings.ini Changes: Renamed Settings.ini variable "GamesInCollection" to "Games#"
Data#.ini Changes: Added variable to control usage if CLS-DiskSpan, also improved descriptions and help included in the ini files. Bug Fix: Fixed bug that prevented the selection of the conversion output folder when creating an AIO collection conversion. Bug Fix: Fixed folder naming bug when creating a single disc conversion. Bug Fix: Fixed a bug where compressor shows step 5 as step 6 and effectively skiping step 5 if ISO creation is set to no (N). Bug Fix: Fixed bug that when creating a single disc conversion, even if an archive already existed UCC would still re-create it, now it won't. Visual Changes: Added a cosmetic distinction between regular and AIO collection conversions when selection of source folder is asked. Files/Behavior Changes: UCC Now copies all files & folders from the Common\Setup sub-folder to the conversion folder to allow for redist, cracks & extras, as well as pre-compressed common data archives. Bug Fix: FreeArc compressor no longer includes empty version of excluded folders when include is set with a single wildcard (*). Bug Fix: Fixed error with bad exclude switch in compressors command when exclude functions are empty that caused the compressor to return an error. FreeArc Methods: 48 new presets added to easily set some more complex (combined) methods, for example: type precsrep for precomp+srep+lzma:a1:mfbt4:d256m:fb128:mc1000:lc8 method. Visual Changes: Output for Srep/7zip/rar/srep64 FreeArc external compressors is no longer shown, resulting in a more clean visual output during compression. Code Clean-up: Improved compression & autorun creation section of the batch code resulting in much smaller code, removed unnecessary parts of code as result of the changes. File Changes: Updated embedded srep version to 3.2 (previously 3.0). Pre-Release Work-in-Progress version (First Evolution from simple compress.bat to full feature compressor). Please read the tutorial to understand all the features of UCC. Please be advised: For CIUv2 to unpack archives created with the UCC included compressors you may need an updated arc.ini file for CIUv2 (depends on the compressor & CIUv2 version you use). Q: What should I put in the Discs# variable in settings.ini if I don't know how many discs the conversion will be? A: Although the UCC Tutorial specifiy that the Discs# variable is numeric (meaning numbers only) it isn't exactly accurate, the variable is used for conversion folder naming and some on screen display during the script, so you can either put any number in there and change it once you finish compression and know the correct number or just input a placeholder like a hashtag sign (#), you can even input multiple of these signs (##). Q: Can you add support for compressor *input compressor name here* ? A: Maybe, I'm willing to give it a try, just let me know the name of the compressor and where to get it and I'll look into it. Q: Can I add new compressors to UCC myself if I wanted to? A: No, I'm afraid not, UCC keeps it's included files compressed within the executable and only extract them temporarily during operation, even if you were to copy the file elsewhere and edit them you couldn't re-pack them into the Converter.exe file and UCC cannot read them from anywhere but the temporary folder it uses. UPDATE: As of version 4.1.3.2 Update 2.0 a new feature was added to allow adding & updating compressors, see the new tutorial pdf file or the wiki for details. Q: Can you make a video tutorial? A: Sorry, but no. I'm afraid I don't know how, nor do I have the needed tools to make an effective video tutorial, you'll have to use the WiKi or PDF tutorial for now. I do however welcome anyone who uses UCC to make a video tutorial based on the written ones, if you do make one, please send me a link to the final product so I could add it to the OP and the UCC WiKi. Q: I get an error at the very beginning of the compression, why? A: If you are using V4.1.3 or V4.1.3.1, there is a bug that slipped through the beta tests that caused the described problem when selecting an output folder instead of clicking cancel to use the default one, Please download & use UCC V4.1.3.1 Hotfix or newer to solve the issue. Q: I Keep getting an error while compressing files with Precomp, can you help? A: Unfortunatelly in UCC versions older than 4.1.3.2 Precomp versions 0.4.3-0.4.6 are broken, you can still use older versions of precomp without a problem. Q: I think I did everything correctly but the Setup.exe & Setup.ico files are not moved to conversion folder, why? A: Assuming they are indeed in the [Setup] sub-folder (otherwise you'd have gotten an error), you must have a mistake in your Settings.ini file, some variables in Settings.ini are used for folder naming and if they are left blank could cause problems with UCC copy commands. The latest version of UCC is attached to this post, as well as the PDF Tutorial. As I said, I attached the Tutorial in PDF format (Rar Archived), that said, I highly recommend using the UCC Wiki in the link bellow, it will be updated more frequently and I think is written better. Ultimate Conversion Compressor (UCC) is free to use as is, I've put a lot of time and effort into making Ultimate Conversion Compressor (UCC), All I ask is that you be respectful for said time and effort. Please, do not distribute Ultimate Conversion Compressor (UCC) on other websites without my expressed permission, do not attempt to get the Ultimate Conversion Compressor (UCC) source code and/or distribute it freely without my expressed permission. Stealing other people work is not nice!!! Thank you for reading, I hope you find UCC useful. IMPORTANT: I've added a new DISCLAIMER section to the OP, it's nothing big but I ask that you please read it!!! I'm sorry I had to resort to this, I didn't expect it nor wanted it but some people have no limits and a whole lot of audacity. I recently discovered another thread on this forum where a user somehow got his hands on my source code for V4.1.2 of UCC (that was back in September 2016 apparently) and posted it without permission, hell, without even asking for permission, furthermore said user edited the script, removed all none essential code parts (Author notes) and replaced all names and credits (Including my own) with his name. Said user didn't even make a good effort to hide the theft, he included in that thread a screenshot of UCC I took that clearly shows my name. I of course reported it and the thread was removed to my request, but I need to take steps to hopefully prevent it from happening again. That said, Since it's a free tool written in batch language I don't have much in the way of legal actions (if at all), I have to count on people good grace to read and follow my terms. Please Note: This have no effect whatsoever on v4.1.3.2 of UCC or any future versions, I do not intend to abandon UCC in the foreseeable future, especially not because of a single rotten apple. Last edited by vollachr; 11-04-2018 at 02:39. This post is only here to let you know the list of games and allow for progress checks. New Tutorial pdf attachment uploaded as well, Updated Arc.ini attachment to match too. Last edited by vollachr; 26-03-2018 at 07:23. Sorry for that, I missed it during tests, it is now fixed, attachment of previous file for Hotfix 1 has been removed to prevent using the bad version. See OP for details and download. As described above, whenever an error occur during compression UCC will output the entire original error message generated by the compressor to a text file called Error.log, this should make it easy to troubleshoot problems. When compression ends without any errors the empty Error.log file will be removed. This is actually an evolution of the previously mentioned feature I posted about in my last post in this thread (see here). A new option in Settings.ini called SpanRecords is added, when enabled (set to "y"), UCC will create a simple Records.ini file for installation of CLS-Diskspan archives. This is required for use with CIU v2.0.3.9 U11 or newer. It also helps in occasions where CIUv2.0.5g causes Setup.tmp errors on Installation Cancel & Finish, if this is the case, use the option to generate the Records.ini file and use it instead of the [ExtractSettings] section of CIUv2 Setup.ini file. A new option in Settings.ini called DatanRecords is added, when enabled (set to "y"), UCC will generate Records.ini file to be used with CIU v2.0.3.9 Setups. The file will be created in the first disk folder after the first archive is created and will update with additional records after each additional archive is created. This is only needed if the Setup you created was designed using CIU v2.0.3.9, make sure to disable the option if it wasn't created with CIU v2.0.3.9. All of the above features are still being worked on & tested, if you want to help test them please send me a PM. MAJOR thread cleanup, leaving only most recent posts, as requested. Last edited by vollachr; 19-04-2018 at 02:51. If you are able to help with logging winrar errors to file than please let me know. Also would like your input on that last point, about the compressors. I know and I said I'll consider it, I have, right now, due to new compressors releases (e.g xtool) and lack of time or will to test them, I'm starting to think it's the right time to make that change. Also, it appears that the UCC rar archive is going to be smaller this way. Not to mention the executable file. Still, I'd like to get more feedback on this before making my decision. Last edited by vollachr; 22-04-2018 at 00:02. Also, thinking & working on trying to make the UCC script a Batch/VBS hybrid, which will mean it will hopefully have a simple message box based GUI added to it, but that's still a big maybe as it is a huge undertaking so it'll probably won't be in Update 3.0, also, if it does happen, I'm gonna try and change the main archive programs (FreeArc, 7Zip, WinRAR) to use the GUI version of their executable files to avoid command line windows and assure progress is shown. Last edited by vollachr; 22-04-2018 at 07:48. Weird, I was sure I posted it about 5 hours ago. Maybe there was a connection error, or maybe I accidentally closed the browser tab without submitting (after preview), who knows, no big deal. Announcement: UCC v4.1.3.2 - Update 3.0 is now released!!! Tutorial & Wiki Updated as well.